This album is heavy on the live side and laden with collaborations. 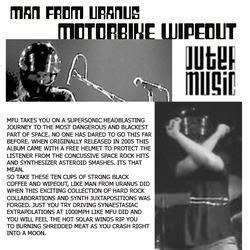 The title track Motorbike Wipeout was recorded live at the Speaker Palace in London with members of the Little Princess Orchestra. Smeared all over the road was recorded at the Moonbase with Kevin Laska, a Fireman with a rather massive guitar amplifier and a sound like sheets of metal. Watch out for the Giant Pickle (advice I should start taking into practice) and Speedworm were recorded with Agaskodo Teliverek, from Hungary. Soraya’s Gone to NYC, one of my few moments of singing. Soraya was a cool street chick with a bit of Courtney Love Chic who played guitar. That’s her playing guitar on the track which I later took and added vocals to when she left for New York City. with a Brazilian saxophonist. Same for Je ne sais pas, and the girl singing is Sam Amant, who I played with as a duo quite a lot at that time. Impending Danger and Acceleration Drone were recorded at the Moonbase with Ben Kingsbury on drums. 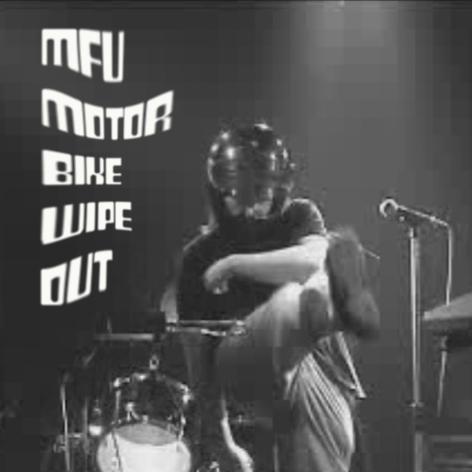 Wheeling off into Eternity is a live recording from Bern, Switzerland with Simon on decks and the drummer geezer from Brain of Morbius, a sci-fi punk band we were touring with, on drums. Suzuki, a brand of motorbike, was recorded live in London with the Legendary Damo Suzuki, Agaskodo Teliverek, and horn players from the Skeletons, a NY band.